Technomad is now shipping a highly robust stainless steel mounting solution for its high-power AS Series of weatherproof advanced audio loudspeakers. Its fixed position mounting design eliminates sagging common with friction mounts, ensuring long life outdoors and maximum stability for large loudspeakers. 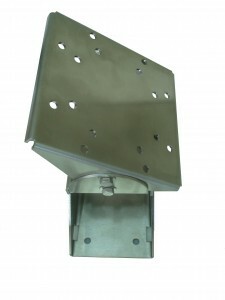 Sized at 8″x12″x8″, the design offers numerous dedicated holes that allows installers to position any AS Series loudspeaker vertically or horizontally at a variety of angles. This gives sound designers, contractors and end users plenty of options to achieve the best angle and audio directivity. The stainless steel design prevents weather-related erosion over time, and stability is further reinforced through an included safety cable for harnessing. Pole-mount adaption is offered in the design as well to simplify lighting and telephone pole installations. The AS Series consists of the largest and most powerful Technomad loudspeakers, including the Noho and all Berlin models (broad and narrow-dispersion). These loudspeakers are popular in stadiums, athletic field complexes, and other outdoor installations ranging from entertainment to mass notification applications.